The practice of Surya mudra is useful in Reducing the earth element within the body. Earth is the primary component in fat; therefore it is helpful for fat loss. 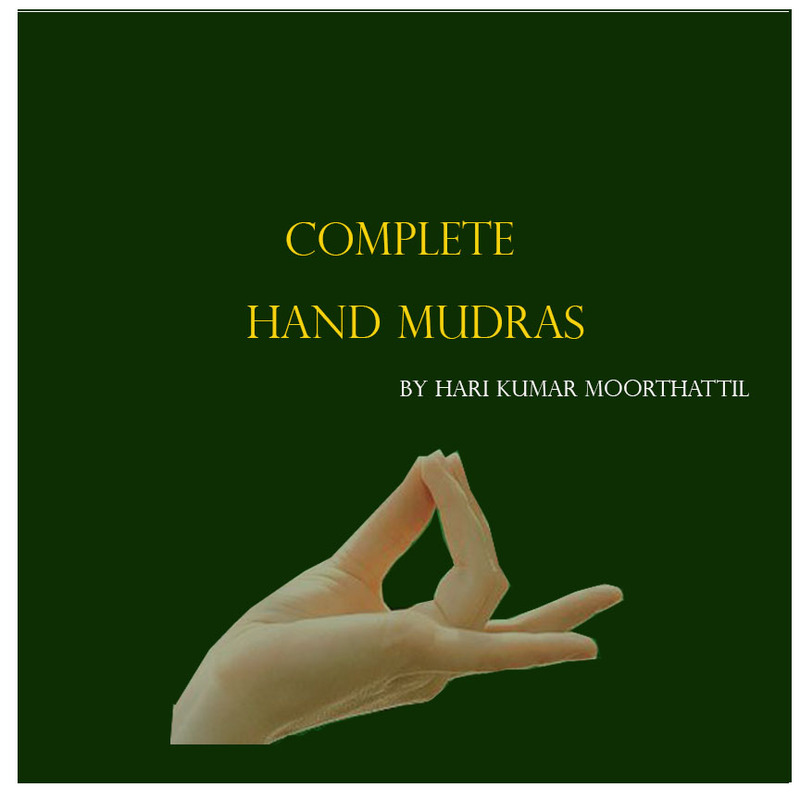 Surya mudra is one of the best mudras for weight loss. It reduces the earth element within the body. Earth element is the primary factor in the fat that causes obesity. When you reduce the earth element within the body, it helps to reduce weight. The practice of Surya mudra increases fire element. Fire element is an important component in Pitta Prakriti, Pitta people are normally able to maintain their ideal weight. The practice of this mudra reduces Prithivi element because of this impact it is also known as Prithvi -shamak mudra.This mudra has other additional benefits that are given below. This mudra is very easy to perform by just placing the tip of the ring finger on the base of the thumb and then bringing the gentle pressure of the thumb upon this finger. Surya mudra helps to increase the fire element within the body and decreases earth element in the body. Fire element plays a significant role in keeping the body temperature. Fire element is related to vision improving fire in the body clears vision problems. Agni is the central component of pita Prakriti. The practice of this mudra helps to increase pita humor within the body. If you want to overcome pita deficiency, then practice Surya mudra. You can use diet to control pitta dosha. If you want to control pitta through diet then go ahead and check out the diet for pitta dosha. Earth element is the central component of Kapha humor. It is useful to overcome Kapha Dosha. Regular practice of 30 minutes is enough to get maximum benefits of Surya mudra; you can do it any time or any position. Early hour of the morning or when you are in meditation is the best choice to get the best result. 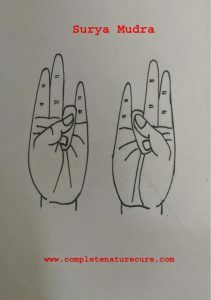 The practice of this mudra increases fire element within the body. It will lead to an increase in body temperature. If you are having a fever don’t do this mudra. It reduces the fat element within the body if you are underweight don’t do this mudra. Also, don’t do this mudra in summer or hot conditions. It increases Pitta humor and decreases Kapha humor. 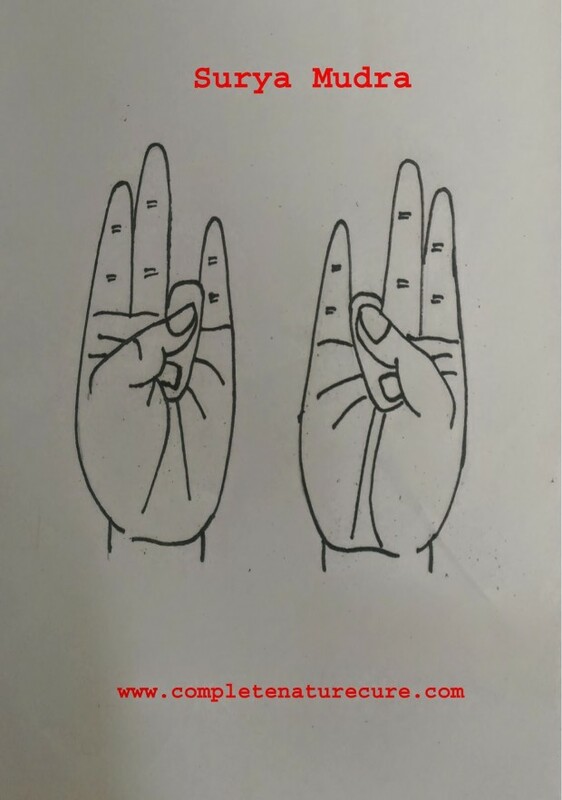 If you are a Pitta excess or Kapha deficient person then do this mudra in moderation only. These are the things you should consider to get all the benefits of Surya mudra.